Whether you know how to swim or not, it's important to have a backup plan in case you get stranded in the water for a long period of time. Swimming for an excess amount of time can cause exhaustion and before you know it, you'll be in danger of drowning. While we may not always carry a life vest with us, this hack can work just the same! 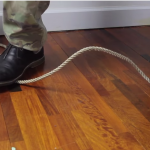 This video tutorial will show you how you can actually use your pants to keep you afloat! This amazing hack could save your life and help give you a higher chance at surviving the roughest waters. Check out this amazing video tutorial that shows you how to float with your pants on the next page! Learned this in the boy scouts. People should make sure their kids are in the scouting programs to learn these things. You can float with pants or long-sleeved shirt too. Learned this in boy scouts. This is as old as the navy. Yes,learned it in DWEST training in the Navy. Had to do it in USN boot camp with boots on. Take boots off, then pants, make float collar. I learned this trick in swimming lessons when i was 15. we did it out on the lake with our instructor!!!!!!!! Navy basic training. Week 3. This was a fun day in Navy boot. did it many times in boy scouts.